Since President Trump took office in 2017, the shift to a nationalistic trade policy has been clear. Meanwhile, major US trading partners are seeking to diversify their trade ties by accelerating negotiations with other countries in an effort to secure new markets for exports subject to – or threatened by – US tariff hikes. The move by countries to fill the leadership void left by the US is also apparent at the WTO. A plurilateral alternative for the Appellate Body, put forward by the EU, risks leaving the US out of the picture. Brexit provides a challenging backdrop as well. As the Trump Administration’s focus on trade deficit reduction in talks with China, the EU, Japan, and North America continues, McLarty Associates (MA) provides the following overview of other nations’ trade initiatives for which negotiations or implementation are ongoing. Our goal is to offer potential vehicles for pursuit of companies’ trade and investment policy objectives. Of course, this list is not comprehensive, but includes several talks/agreements that should be on companies’ radar. McLarty stands ready to discuss strategies around each process. This agreement includes Australia, Brunei, Canada, Chile, Japan, Malaysia, Mexico, New Zealand, Peru, Singapore, and Vietnam, representing 13.5% of global GDP and a population of 495 million potential consumers. On January 19, the inaugural CPTPP Commission Ministerial will meet in Tokyo to discuss plans for the remaining four countries who have not yet ratified to do so and to contemplate potential accessions. So far, Korea, Thailand, Colombia, Indonesia, Taiwan, and the UK have indicated interest in joining CPTPP. 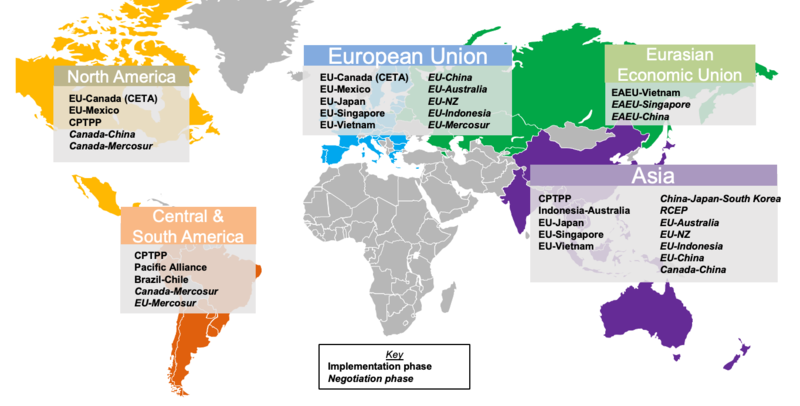 The CPTPP entered into force on December 30, 2018, for ratifying countries (Australia, Canada, Japan, Mexico, New Zealand, and Singapore). Vietnam became the seventh country to ratify with CPTPP becoming effective for Vietnam on January 14. CPTPP is expected to be ratified this year by Chile, where it is under legislative consideration. The Peruvian Trade Ministry expected to ratify the agreement before 2019, but the process stalled amid other priorities. The Malaysian Government has not set a clear deadline for ratification. Brunei’s decision to ratify seems to lie largely with the Sultan and is uncertain at this time. Elimination of tariffs on intra-CPTPP country trade: 90% of goods are tariff-free upon entry into force, putting US exporters at a disadvantage. All services and investment provisions also take effect upon entry into force. Meanwhile, further accession negotiations and ratifications continue. This bilateral trade agreement represents GDP of $2.3 trillion and a combined population of approximately 292 million potential customers. Australia and Indonesia concluded negotiations for a Comprehensive Economic Partnership Agreement (IA-CEPA) on August 31, 2018. The agreement was to be signed on November 14 but delayed over Australia’s decision to formally recognize West Jerusalem as the capital of Israel. Indonesia has the largest Muslim population in the world, with over 90% of its population following Islam. In addition to the political impasse, Indonesia’s opposition leaders have raised questions about foreign ownership caps and Investor State Dispute Settlement, (ISDS). With Indonesia’s upcoming election in April, signing could be further delayed. The IA-CEPA builds on existing commitments in the ASEAN-Australia-New Zealand Free Trade Agreement (AANZFTA) across goods, services and investment. If ratified, the IA-CEPA would allow 99% of Australia’s goods exporters to enter Indonesia duty free or with significantly improved preferential arrangements. All of Indonesia’s goods exports will enter Australia duty free. The EU and Canada Comprehensive Economic and Trade Agreement (CETA) provisionally entered into force on September 21, 2017.Most obligations of the agreement are currently applied, apart from its investment provisions, which are designed to provide an alternative to ISDS. CETAis a trade agreement covering GDP of $20.5 trillion with a combined population of 548 million potential customers. While passed by the European and Canadian Parliaments, it still needs to be ratified by the 28 EU member states. So far, the following have ratified CETA or are reportedly at an advanced stage: Latvia, Denmark, Malta, Spain, Croatia, Czech Republic, Portugal, Estonia, Sweden, Lithuania, Finland, and Bulgaria. Once all member states ratify, the full agreement will formally enter into force. Italy, however, has threatened not to ratify CETA as it considers protections for geographical indications insufficient. CETA has been described as a “modern, progressive trade agreement,” illustrated by its ambitious labor and environmental text.Canada was eager to deepen its trade links to Europe during difficult NAFTA talks, while Europe did not want to lose momentum on growing trade links with North America with the demise of TTIP (Transatlantic Trade and Investment Partnership). The EU and Canada agreed to eliminate tariffs on nearly 99% of goods, and tariffs are reduced on about 90% of agricultural products.Tariffs will remain on meat and eggs, and European geographical indications will be protected. Additionally, Canada has agreed to open public procurement contracts to European suppliers. While tariff reductions are already being enjoyed, the only element that would be affected by a lack of member state ratification — still underway — would be the investment protection court. Investment protection is always sensitivein Europe, but the EU believes it has found middle ground with its new Investment Court System (ICS) that will prevent governments from being forced to pay damages or to change legislation. While a step-back from ISDS, even the ICS is controversial in many EU member states. Belgium requested an EU Court of Justice opinion on the compatibility of the new ICS with EU law in September 2017, and the opinion is expected to come out in early 2019. In a worst-case scenario, the EU and Canada could agree to bifurcate the agreement into an FTA (only requiring ratification by EU institutions) and investment provisions. The EU and Mexico reached an agreement in principle in April 2018 to replace a limited FTA that had been in place since 2000 with a more comprehensive deal. Discussions are now focused on completing technical details for a final text to be ready for legal revision. The modernized accord covers nearly all agriculture (except sugar), additional services, investment protections, and government procurement. It also includes labor, environmental, and anti-corruption provisions. The agreement is an indication of Europe’s interest in promoting the CETA ICS as a viable option to ISDS. The EU and Japan launched FTA negotiations in March 2013, finalizing talks in December 2017. The EU-Japan Economic Partnership Agreement (EPA), the biggest trade deal negotiated by the EU, will create one of the largest free trade zones in the world, covering nearly 30% of the world’s GDP. The EPA represents a combined GDP of $31 trillion with a population of 638 million potential consumers. Ratified in December 2018, the agreement is set to enter into force on February 1, 2019. Exacerbating the disadvantage for US exporters to Japan created by the CPTPP, the deal eliminates about 99% of tariffs on Japanese goods entering the EU and about 94% — eventually 99% — of tariffs on European exports to Japan. The initial gap stems from exceptions for sensitive products such as rice. Rules on investment protection and dispute resolution still need to be negotiated, but are not expected to delay implementation. The EPA’s 23 chapters cover many of the disciplines included in CPTPP’s 30 chapters. On October 19, 2018, Singapore and the EU signed a trade deal on the sidelines of the 12th Asia-Europe Meeting (ASEM) Summit in Brussels. The EU-Singapore Free Trade Agreement (EUSFTA) will eliminate tariffs and reduce non-tariff barriers. It could enter into force before the current mandate of the European Commission ends in 2019. The EU will eliminate tariffs on 84% of Singapore products entering the EU, followed by the remaining 16% of products over the next 3-5 years. The FTA will allow materials sourced from other ASEAN member countries to be labeled as originating from Singapore, which will qualify them for tariff concessions. This will affect key exports including electronics and pharmaceuticals. Market access for services, including financial services and professional services, will be enhanced. Singapore firms will increase government procurement opportunities at both city and municipal levels. Singapore and the EU also signed the EU-Singapore Investment Protection Agreement (EUSIPA) that will replace 12 current bilateral investment treaties between the two entities to offer better investment protection. The European Parliament will discuss and vote on the EUSFTA and the EUSIPA in the first quarter of 2019. Upon approval, the EUSFTA will be ratified and enter into force. Negotiations for the EU-Vietnam FTA have concluded, and the accord will likely come into effect in the second half of 2019. The agreement will include $19.3 billion GDP and 613 million potential customers. The agreement will eliminate over 99% of customs duties on goods and open Vietnamese services markets to EU companies. This is considered the most ambitious deal ever struck between the EU and a developing country. For the EU, the agreement is an important stepping stone to a wider EU-Southeast Asia trade deal. The FTA is separate from the Investment Protection Agreement (IPA), which outlines the guidelines regarding investment-related issues. The European Commission has submitted both the FTA and IPA to the European Council, and the proposals are awaiting authorization before being passed to European Parliament for consent. After Parliament consent is granted, the Council can conclude the trade agreement, while the IPA will be ratified by individual states based on their national legislative processes. Originally, in an effort to distinguish itself from the traditionally more closed economies of Mercosur (Argentina, Brazil, Paraguay, Uruguay), the PA joined FTA partners Mexico, Colombia, Peru, and Chile into a bloc that now seeks to build on tariff reductions through coordination on regulatory and other matters. The PA’s focus has been primarily on streamlining regulations, building an investment-friendly environment, supporting an ambitious digital agenda, and promoting cultural and educational exchanges. The countries have made progress on harmonizing regulations for various industries, including cosmetics, processed food, medical equipment, pharmaceuticals, telecommunications, the financial sector, and transportation. The PA aims to become a platform for trade integration between Latin America and CPTPP, with only Colombia not a party to the CPTPP agreement. In June 2017, the PA announced the creation of an “associate member” role, which opens the option of collectively negotiating trade deals. The first four countries to begin associate member negotiations were Australia, New Zealand, Canada, and Singapore. An increasing number of Latin American countries have expressed interest in or begun the process of becoming full PA members including Costa Rica, Panama, Guatemala, and Ecuador. With pro-business leadership in Brazil and Argentina, the PA has indicated interest in enhancing ties with Mercosur, but this will take time. On October 19, Brazil and Chile concluded the text of a bilateral FTA. The text of the agreement reflects a broad scope, covering non-tariff measures on a range of issues, including services, e-commerce, sanitary and phytosanitary measures, technical barriers to trade, telecommunications, intellectual property, trade facilitation, government procurement, good regulatory practices, and investment. Brazil and Chile already enjoy duty-free trade by virtue of Chile’s associate status in Mercosur. The agreement must be ratified by the Congresses of both countries before taking effect. The deal could provide a bridge to closer ties between Mercosur and the PA, as well as guidelines for trade negotiations between Mercosur and Canada. The EAEU was founded by the leaders of Russia, Belarus, and Kazakhstan in May 2014. The treaty of the union came into force in 2015, when Armenia and Kyrgyzstan joined the bloc. In May 2015, Vietnam became the first country to sign an FTA with the EAEU, which entered into force in October 2016. The deal was expected to benefit Vietnamese garment and food exporters by allowing them to export into the EAEU market without duties, while creating new opportunities for Russian auto manufacturers and agricultural and fertilizer exporters in Vietnam. Bilateral trade between Vietnam and the EAEU is expected to rise to $30 billion by 2030 from a previous base of close to zero. RCEP includes the 10 ASEAN nations of Brunei, Cambodia, Indonesia, Laos, Malaysia, Myanmar, Philippines, Thailand, Singapore, and Vietnam, along with China, India, Japan, Korea, Australia, and New Zealand. This represents GDP of $25.4 trillion or about 30% of global GDP with a population of 3.6 billion potential consumers. Launched in 2012, the 16 countries have completed 24 negotiating rounds. On November 14, 2018, leaders of the 16 RCEP members released a joint statement reaffirming their commitment to reach “substantial conclusion” in 2019 after failing to conclude the deal in 2018 as planned. Seven of the planned 20 chapters are complete. However, with Indonesia, India, and Thailand expecting to hold elections this year, political decisions over sensitive issues should be put on hold and make a 2019 conclusion unlikely. China’s situation is also challenging. Sources familiar with the negotiation note that India presents one of the main obstacles towards completing the deal due to tariff and services sensitivities. Other pressure points include demands from Japan and Australia for high-standard e-commerce rules and differences over ISDS. The parties are due to meet for the 25th round of negotiations in mid-February. Leaders from China, Japan, and South Korea first raised the idea of a trilateral FTA in 2002, but only agreed to start talks in 2012. There have been 14 rounds of formal talks. The trilateral deal, if reached, would form the third-largest trade bloc after the EU and North America, with the 19% of global trade volume and 6 billion potential customers. The latest round took place in Beijing December 6-7 last year. The three parties agreed to the acceleration of negotiations. The next round will be held in Japan, but a date has yet to be announced. Progress is likely linked to progress of the RCEP talks, in which all three parties participate. Beijing has greater incentives now to strike a deal with Japan and Korea, as it seeks to diversify trade away from the US. But the talks will not be easy, with the three facing differences including the level of market liberalization and political conflicts. On May 22, 2018, the Commission opened negotiations for an FTA with Australia. Talks were formally launched in June 2018, with the most recent round in November 2018. The agreement covers $19.4 trillion in GDP and 536 million potential customers. According to the EU negotiating mandate, the “agreement should exclusively contain provisions on trade and foreign direct investment related areas.” The mandate did not cover investment protection and resolution of investment disputes. In November, nearly all disciplines were discussed, and the next round is scheduled for March 2019. The sectors which make up the bulk of EU exports to Australia are transport equipment, machinery, appliances, chemicals, food, and services. A trade agreement could increase trade in goods and services between the two partners by over a third, according to estimates. This FTA encompasses $19 trillion in GDP and 515 million potential consumers. On May 22, 2018, the European Council authorized the Commission to negotiate an FTA with New Zealand and adopted the related negotiating directives. As with the EU-Australia negotiations, the EU’s negotiating mandate stated that the “agreement should exclusively contain provisions on trade and foreign direct investment related areas.” The mandate did not cover investment protection and resolution of investment disputes. Although the mandate declared that the agreement should “ensure the highest possible degree of trade liberalization,” it also stated that the most sensitive products should be covered by specific provisions, thus taking European agricultural sensitivities into consideration. The most recent round was held in October 2018, during which the following issues were discussed: trade in goods; rules of origin; customs and trade facilitation; technical barriers to trade; sanitary and phytosanitary measures; trade remedies; trade in services; investment and capital movements; intellectual property rights; public procurement; trade and competition; trade and sustainable development; energy and raw materials; transparency and good regulatory practice; and dispute settlement. The two sides agreed on follow-up actions to be completed before the next round of negotiations, scheduled for February 2019. The EU launched negotiations with Indonesia on July 18, 2016, following a joint exercise to determine the scope and ambition of an agreement. The sixth and latest round of negotiations took place on October 15-19, 2018. The sides have laid the groundwork for 18 negotiating areas, including trade in goods, trade in services, investment, trade and sustainable development, and competition. During the sixth round, progress was made on key issues, including state owned enterprises and government procurement. Parties also offered their initial offers on services and investment. The next round of negotiations is set to take place March 11-15 in Brussels. Talks between the EU and Mercosur have dragged on since 1999. While still difficult, recent talks have advanced further than previous efforts. In late December 2018, EU Trade Commissioner Malmström said that Brussels will focus on finalizing a deal with Mercosur after the EU-Japan deal goes into effect on February 1, 2019.However, Brazil’s election of President Bolsonaro may complicate efforts to finalize a deal. Current negotiations cover issues including tariffs, rules of origin, technical barriers to trade, sanitary and phytosanitary measures, services, government procurement, intellectual property,sustainable development, and SMEs. The latest round of technical talks was held December 10-13in Uruguay. According to an EU spokesman, the talks ended without agreement and negotiations will restart in 2019. The spokesman added that “…more work is still needed at [the] technical level, notably on the EU’s outstanding issues, and meetings will resume under the Argentinian presidency of Mercosur.” In December, Argentina took over the rotating Mercosur presidency for the next six months. Challenging issues include autos, rules of origin, and agriculture. German Chancellor Merkel and French President Macron have both expressed pessimism about the potential deal since the election of Bolsonaro,who has called for a revamp of Mercosur. Further, Macron has warned that he will oppose an EU-Mercosur deal if Bolsonaro pulls Brazil from the Paris Climate Agreement as threatened. The EU-China Comprehensive Agreement on Investment (CAI) talks were officially launched in November 2013, and the two sides have conducted 17 rounds of formal negotiations, the most recent in May 2018. Issues under negotiation include investment access and protection; a regulatory framework for investment, including transparency, licensing, and authorization procedures; sustainable development; and dispute settlement. In July 2018, at the 20th China-EU leaders’ meeting, China and the EU exchanged market access offers, both calling the proposed bilateral investment treaty a top priority in relations. The two sides pledged to accelerate discussions on the joint text and market access offers. CAI would be the EU’s first stand-alone comprehensive investment agreement with China. Technically, it would replace the 26 bilateral investment protection agreements currently in place between China and 27 EU Member States. In May 2018, the EU completed its sustainability impact assessment, finding that CAI would potentially lead to a rise of 1.9% in EU’s existing FDI stock in China, whereas Chinese FDI stock in EU would potentially rise by 0.9%. Enhanced regulatory transparency and legal certainty may stimulate more FDI than estimated in both markets. However, issues linked to Chinese IPR concerns and China’s market economy status may stymie the talks. The EU and China have a very close economic and trade relationship. Mercosur and Canada launched exploratory FTA talks in 2011, which ended the following year without formal negotiations. Exploratory talks restarted in 2017 and Canada and Mercosur announced the launch of formal negotiations for a comprehensive Canada-Mercosur FTA in March 2018. The agreement is expected to cover market access for goods and services as well as provisions on labor, the environment, trade and gender, and SMEs, among others. Negotiations began in March 2018 in Ottawa, with a focus on reducing tariffs on forestry, automotive, chemical-plastic products, pharmaceuticals, aluminum, and information and communications technology. The most recent round in December 2018 in Brazil yielded an exchange of improved offers for goods trade and a ratified commitment to exchange offers on services at the beginning of 2019. Exploratory talks for a Canada-China trade deal began in April 2017 to build on the October 2014 Foreign Investment Promotion and Protection Agreement (FIPA) with China. In December 2017, exploratory negotiations slowed due to Canada’s insistence that the deal contain progressive provisions on labor, environment, gender, and governance. Negotiations halted in May 2018 when Canada blocked the $1.5 billion takeover of Aecon Group Inc. construction firm by a Chinese company for reasons of national security. These challenges remain. Further, the USMCA caution against trade agreements with non-market economies complicates matters. Last November, however, PM Trudeau announced that the USMCA clause would not prevent Canada from continuing talks with China. At this point, the timing of the next round is unclear – and unlikely in light of bilateral tensions over Canada’s arrest of Huawei CFO Meng Wanzhou. The EAEU and Singapore started negotiations on an FTA in August 2017. Since then, multiple rounds of full-scale negotiations and several series of intersessional meetings have been held on a range of trade issues including goods, services, and investments. The intention is to finalize negotiations between EAEU member states and Singapore on bilateral agreements on the liberalization of trade in services and investment by the middle of 2019. This will enable the signing of a single package of agreements forming a full-scale free trade area. In May 2018, the EAEU and China signed an agreement to cut trade barriers and facilitate economic activities. The agreement covers 13 chapters, from customs cooperation and trade facilitation, intellectual property rights, to government procurement, as well as e-commerce and market competition. The two sides hope the deal will go into effect in early 2019. In November 2018, Egypt and the EAEU signed a framework document for negotiations on an FTA. They agreed to hold a joint business forum in the first half of 2019 to boost their economic and trade partnership, and expressed hope to complete an FTA in 2019. Russia and Egypt also agreed to work jointly on new investment projects, especially in transport, manufacturing, and energy – including both oil and nuclear. In November 2018, a temporary FTA between the EAEU and Iran was ratified. The agreement is meant to liberalize and simplify trade in goods between the sides, establish a basis for developing a free trade zone, and maintain economic and trade cooperation. A fully-functional agreement on the FTA is expected in three years’ time, by 2021. EAEU officials are also reportedly pursuing FTAs with Israel and India.